Our Maximum Wildlife tours have been designed to offer the best and most Australian wildlife in the shortest comfortable duration. There is little overlap – so you will see different birds, mammals and reptiles in the Top End than in East Gippsland, which are different again to those seen in the Mungo Outback and Great Ocean Road. The components of the tour are also designed to run at the best times of year for wildlife-viewing. Top End (the North) – the Northern Territory Top End in particular Darwin, Kakadu and Mary River National Parks. This country is tropical dry savannah with monsoon rainforest, mangroves and freshwater habitats. Mungo Outback – the desert north west of Victoria, including Mildura and Hattah Kulkyne National Park; and the south-west of New South Wales, including Mungo National Park and Wentworth near the junction of the Murray & Darling Rivers. This country is inland rivers, riverine woodlands, desert bluebush & saltbush plains and mallee eucalypt woodlands. East Gippsland – the far eastern corner of Victoria, including Croajingolong, The Lakes and Snowy River National Parks, the famous Snowy River and Orbost and Mallacoota. This country is mountains and coastal lowlands, warm temperate rainforest, rivers and estuaries, heaths and coastal woodlands. You Yangs & Great Ocean Road – just west of Melbourne including the You Yangs, Serendip, Port Campbell and Great Otway National Parks. The Western Treatment Plant at Werribee is also in this region. This country is dry open woodland, grassy plains, beaches and coastal heaths, with a small area of mountain forest and rainforest. The following shows which animals are seen where, in the order of Mammals – Reptiles – Birds. 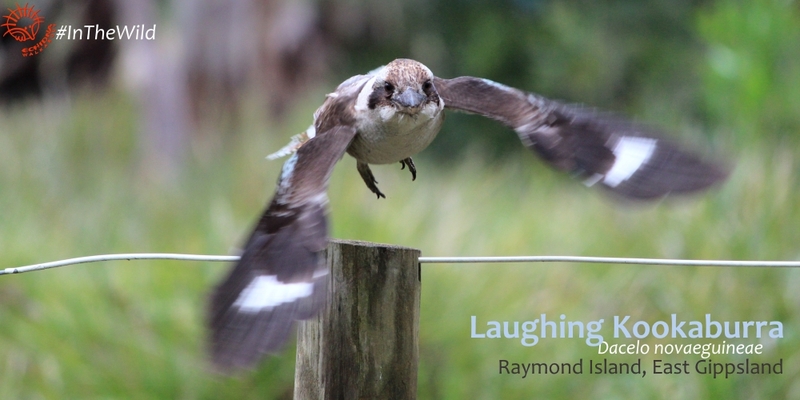 This is Part 1 – part 2 covers Possums & Gliders, endemic Rodents, Cuckoos, Bowerbirds, Treecreepers, Monarch Flycatchers, Pilotbird, Bristlebirds, Currawongs & Woodswallows, Snakes and Skinks. Echidnas are frequently seen in East Gippsland, and sometimes seen on the Great Ocean Road and in the You Yangs. Platypus is only reliably seen in the Croajingolong area of East Gippsland – read and watch a video of one of our Platypus sightings. Echidnas are one of very few Australian mammals that will occasionally approach humans. 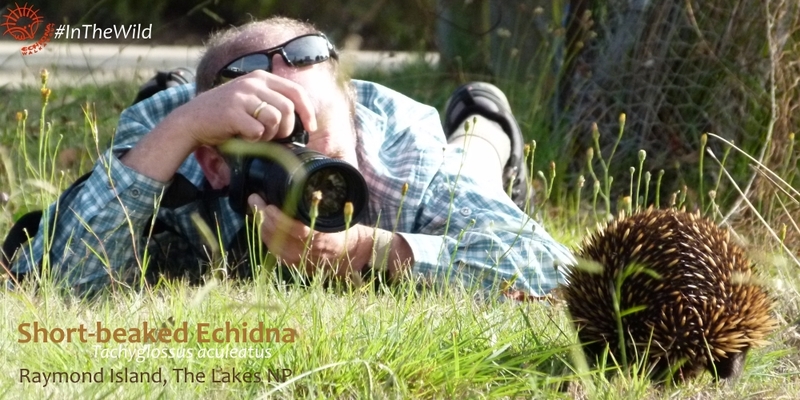 This guest started photographing when the echidna was over 10metres away, and the echidna walked right to him. In the Top End we see Agile Wallabies, Antilopine Kangaroos, Wilkins’ Rock-wallabies and, if we are very lucky the rare Black Wallaroo. In the Mungo Outback we see huge numbers of Red and Western Grey Kangaroos, and occasionally an Eastern Grey Kangaroo. 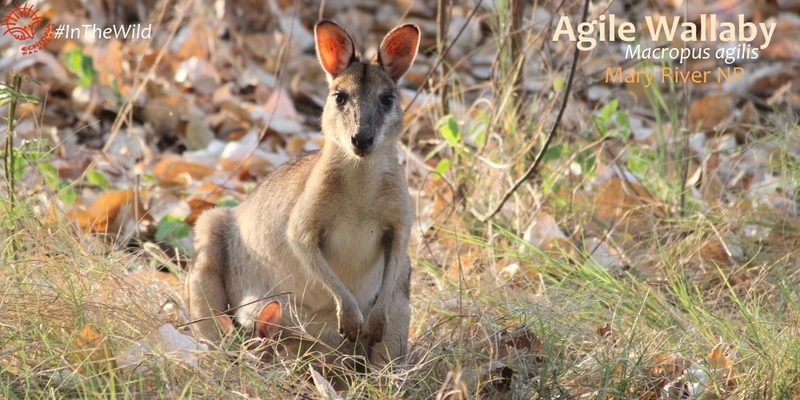 Down south Eastern Grey Kangaroos are frequent – sometimes in huge mobs of 60 plus – and Red-necked and Swamp Wallabies are also seen in smaller groups. Koalas and Wombats can only be seen in the south. 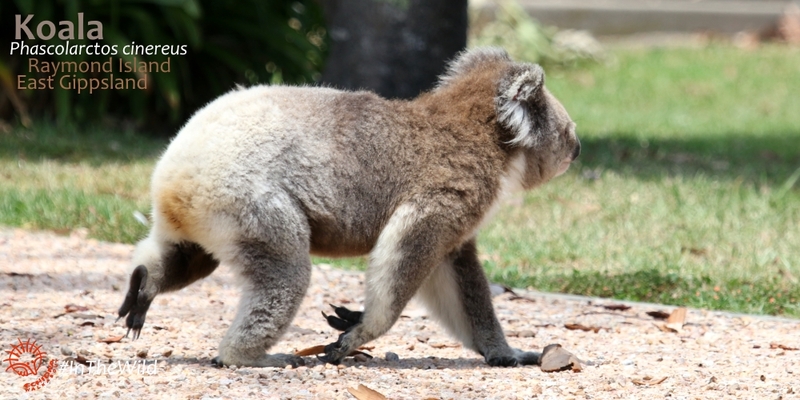 East Gippsland is home to both, and koalas can be seen on the Great Ocean Road & You Yangs. Of the omnivorous bandicoot family we sometimes see the Southern Brown Bandicoot and Long-nosed Bandicoot in East Gippsland, and only the Southern Brown on the Great Ocean Road. The Northern Brown Bandicoot lives in the Top End, but we only see them occasionally. More Australian marsupials – Possums, Gliders, Potoroos – in Where To See Australian Wildlife, Part 2 (coming soon). The Dingo is best seen in the Top End – we usually see our beautiful native wolf trotting beside the road in the early morning. Down south, in East Gippsland we often see Burrunan Dolphins (a new species, recently split from the Common Bottlenose), Australian Fur-seals and sometimes a Humpback Whale. Australia’s flying-foxes are large fruit-eating bats – we see Black and Little Red Flying-foxes in the Top End in huge colonies, and Grey-headed Flying-foxes in East Gippsland. 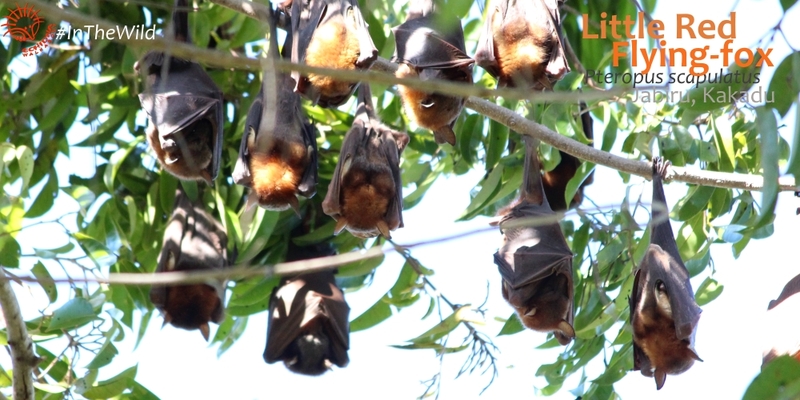 Watching the flying-fox flyout is one of the wildlife highlights of the Top End. Other bats are also seen, but they are too small and fast to identify. There’s a full list of the mammals of East Gippsland here. Saltwater and Freshwater Crocodiles can only be seen in the Top End. 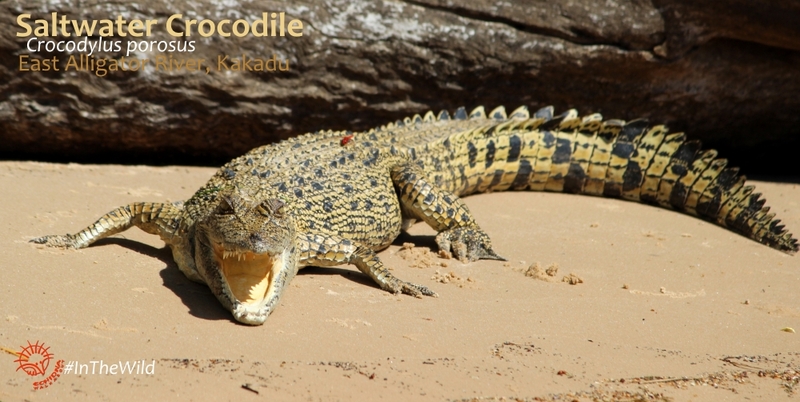 We take two cruises – one on the Mary River (famous for having the largest population of large crocodiles in the world) and one on the East Alligator River, the border between Kakadu National Park and Arnhemland. On each cruise we can see up to 40 Saltwater Crocodiles clearly. We usually see at least one Freshwater Crocodile on the trip too. Lace Monitors are usually seen in East Gippsland, but we also see one occasionally in the Mungo Outback, near the Murray River. Sand Goanna is more common up there. We have seen Gould’s Goanna in the Top End, and their numbers are starting to recover from the introduced Cane Toad. Gilbert’s Dragon is common in the Top End, Central Bearded Dragon & Mallee Military Dragon in the Mungo Outback, and Jacky Lizard in the south. 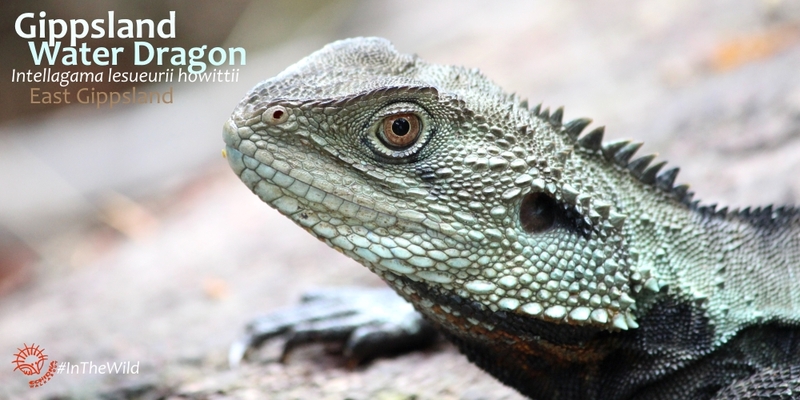 East Gippsland also has its own subspecies of Water Dragon – the Gippsland Water Dragon. 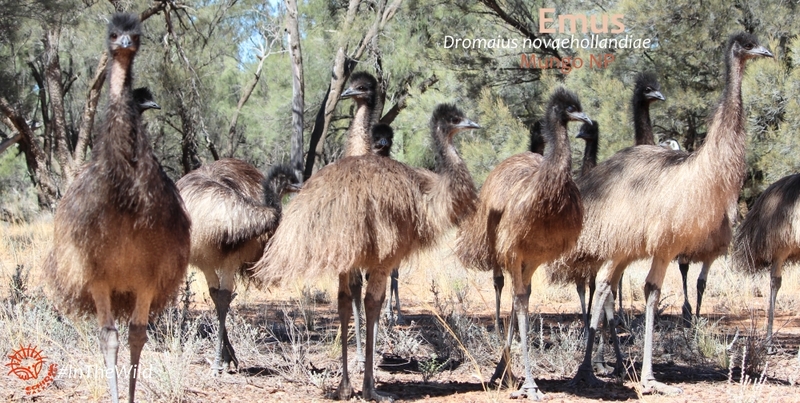 Emus are best seen in the south – Mungo Outback is the best viewing, followed closely by the You Yangs. We sometimes see them in East Gippsland too. Brolgas, Jabirus (Black-necked Stork) and Australian Bustards are best seen in the Top End. Brolgas are rarer in the south, but can also be seen on an optional visit to the Western Treatment Plant. 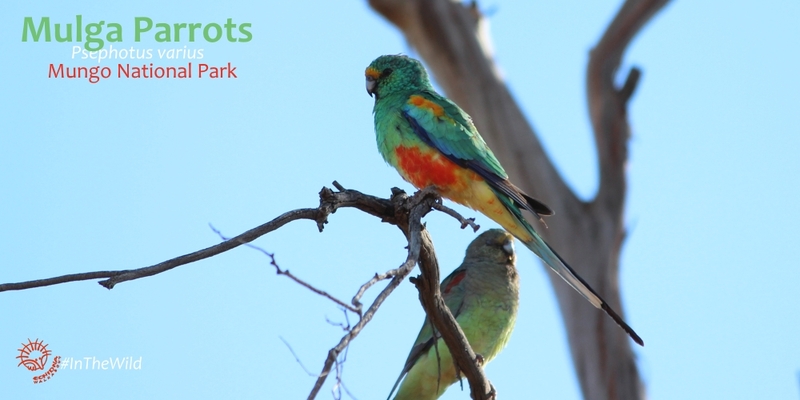 Parrots and cockatoos are a wildlife feature of Australia – we have over 55 species, which is nearly 80% of the world’s cockatoos and over 12% of the world’s parrots. They are present everywhere, in every environment. Every one of our destinations has parrot highlights, but the best place to see them is the Mungo Outback for sheer numbers and stunning colours. 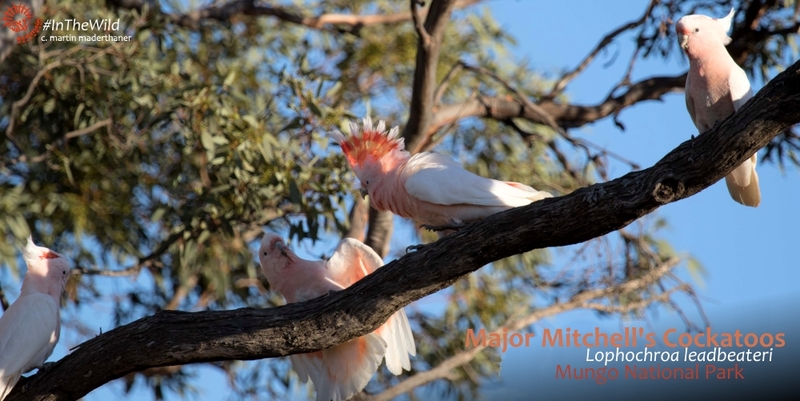 Major Mitchell’s and Sulphur-crested Cockatoos, Little Corellas and Galahs, Yellow Rosellas, Rainbow Lorikeets, Regent, Mulga & Red-rumped Parrots, Mallee Ringnecks, Eastern Bluebonnets are all seen here. We have even seen Cockatiels and Budgerigars in good seasons. 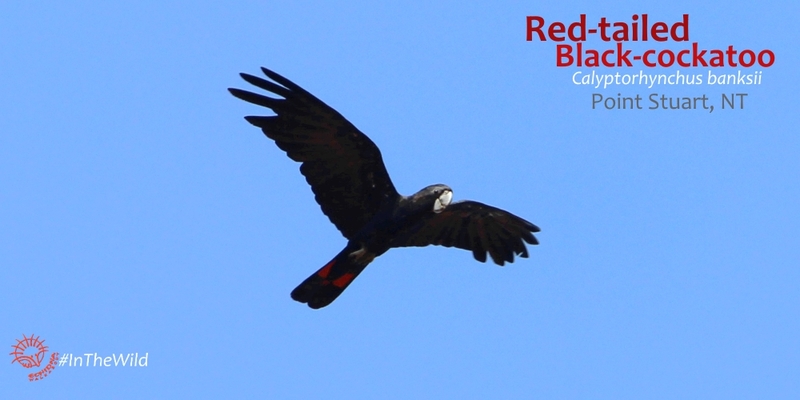 East Gippsland is also great for parrots – Yellow-tailed and Glossy Black-cockatoos, Gang-gangs and Sulphur-crested Cockatoos, Galahs, Little Corellas; Crimson & Eastern Rosellas, Rainbow & Musk Lorikeets, Turquoise & King Parrots. The Top End has fewer parrots, but they are spectacular – huge flocks of Red-tailed Black-cockatoos, Little Corellas & Sulphur-crested Cockatoos, Red-winged Parrots, Red-collared & Varied Lorikeets. Every region in Australia has a species of fairy-wren – gorgeous tiny, usually blue birds with long tails. The Top End has the Red-backed Fairy-wren – one of the few that has no blue on it at all. East Gippsland and the You Yangs/Great Ocean Road are home to large numbers of Superb Fairy-wren, and East Gippsland also has the related Southern Emu-wren. 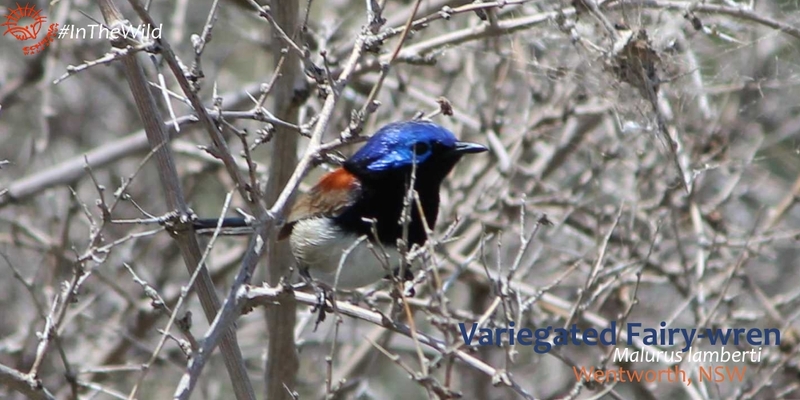 The Mungo Outback is undoubtedly the best place to see fairy-wrens: the Splendid, Blue-winged, Superb and Variegated Fairy-wren are all seen here, while their rare relative the Mallee Emu-wren lives nearby and can be seen by patient birdwatchers. East Gippsland is spectacular for honeyeaters – up to 15 species are regularly seen on our trips to this region including the Scarlet, White-eared, Yellow-tufted, Crescent Honeyeaters & Eastern Spinebill. Read about the honeyeaters of far East Gippsland here. The Great Ocean Road has some overlap, but the Singing Honeyeater and White-plumed area also seen. 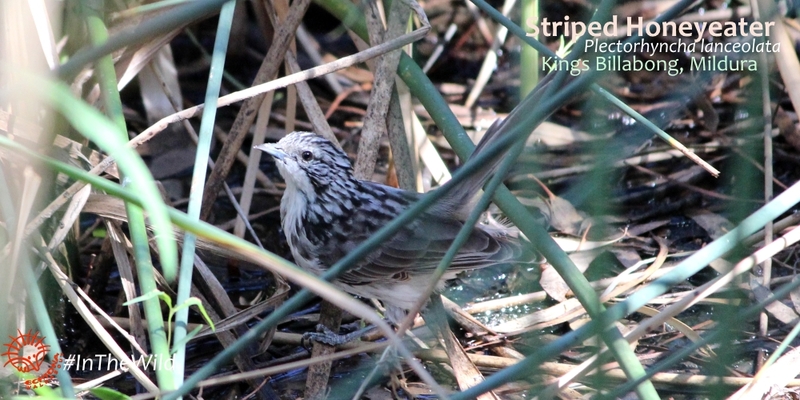 The Mungo Outback is home to large numbers of Spiny-cheeked, Yellow-plumed, Blue-faced & Singing Honeyeaters, Yellow-throated Miner. When seasons are good we can see Crimson & Orange Chats, White-fronted & Striped Honeyeater and Little or Noisy Friarbird. In the Top End there is a different suite of honeyeaters – Brown, Dusky, White-gaped, Rufous-banded & White-throated Honeyeaters and Silver-crowned & Helmeted Friarbirds are regularly seen. Bar-breasted, Rufous-throated, Banded and Red-headed Honeyeaters are sometimes seen. 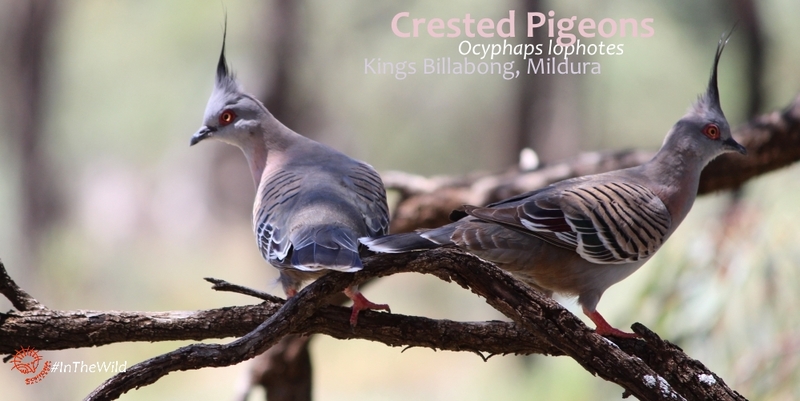 East Gippsland has a lot of pigeons and doves – Wonga & Crested Pigeon and Common Bronzewing are common. 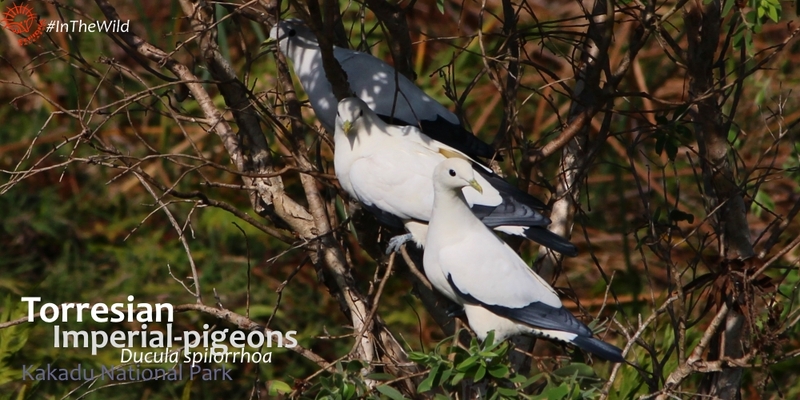 Topknot Pigeons visit in summer, and White-headed Pigeons – once confined to the far east – are now spreading throughout the region. Brush Bronzewings live in the region but are more often heard than seen. The Top End is a wonderful place for pigeons and doves. Peaceful and Bar-shouldered Doves are the most common bird call in almost every stop. We often see Torresian (Pied) Imperial Pigeon, Rose-crowned Fruit-dove, Emerald Dove and Chestnut-quilled Rock-pigeon. Rarely seen are Diamond Dove, Partridge Pigeon and Banded Fruit-dove. 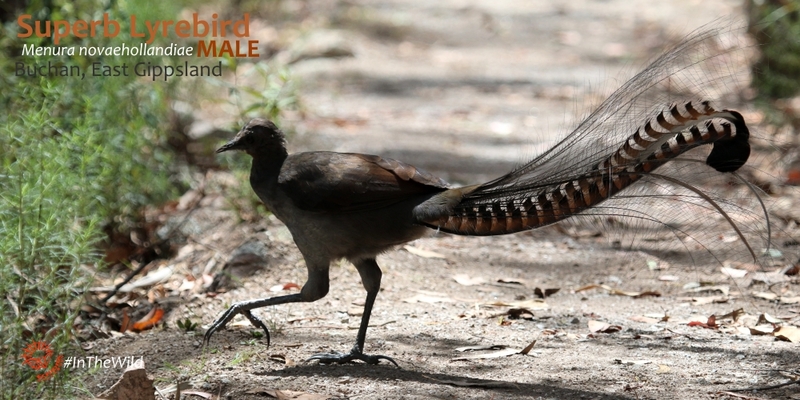 The Superb Lyrebird – the world’s greatest songbird – lives in the forests of East Gippsland and is a regular sight, especially in the cooler months of August, September, October and April, May. East Gippsland is also famous for the calls of Eastern Whipbirds and Bell Miners. Kookaburras and Kingfishers can be seen in every region of Australia – the famous Laughing Kookaburra is a regular sight in East Gippsland and Great Ocean Road, while the beautiful Blue-winged Kookaburra is seen in the Top End. Sacred and Azure Kingfishers can be seen in all our destinations, but the Forest Kingfisher is only seen in the Top End, and the Red-backed Kingfisher is only seen in the Mungo Outback. Read more about where and how to see kingfishers and kookaburras here. And there’s more! Read about the other bird and mammal families of Australia in Where To See Australian Wildlife, Part 2. 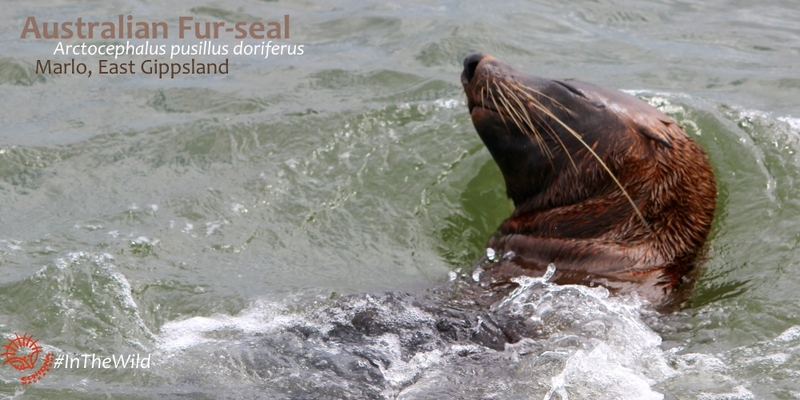 Join us to see the most Australian wildlife on your Australia visit. We also see amazing diversity of wildflowers and plants on the Maximum Wildlife tour. Contact us about our Maximum Wildlife tours – we can guide you on best times of year and best trips for your interests. Where To Watch Australian Animals, part 2.